North Coast Journal graphic after a map by Kenneth Doig The most important languages derived from Proto-Germanic. Last time, we saw how the precursor of English, Proto-Germanic, was an oddball among other languages derived from the Proto-Indo-European (PIE) spoken by nomads in present-day Ukraine around 6,000 years ago. Proto-Germanic is odd because its verb and noun forms are much simpler than those found in its sibling PIE tongues. In addition, it uses hissy "fricative" consonants in lieu of PIE's regular "voiceless stops." English, in turn, is the black sheep of the Germanic language family. For one thing, its grammar is far simpler than any of its siblings. For instance, it's the only language spoken in Europe that lacks gender (other than one dialect of Swedish); whereas German, for instance, has der, die and das to signify masculine, feminine and neuter, English has plain old the. 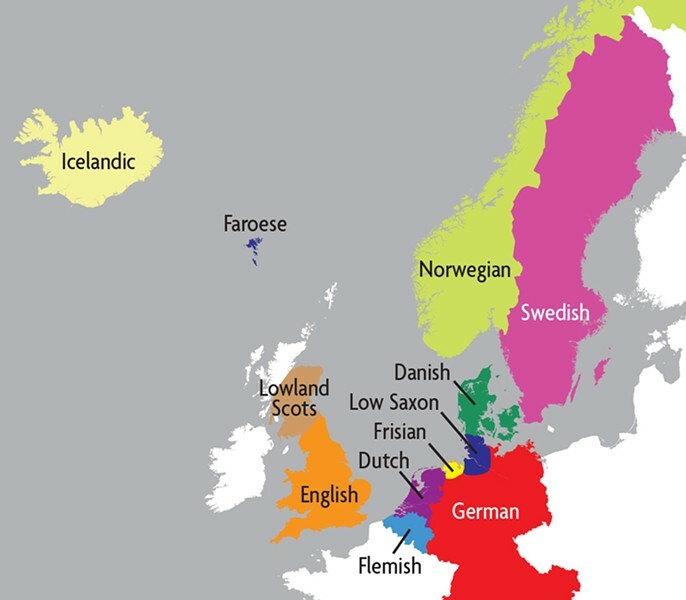 English probably lost its gendered nouns in the transition between Old and Middle English, as Danish and Norwegian newcomers struggled to learn "Englisc," streamlining it in the process. Although Old English has traditionally been linked with Angles, Saxons (hence "Anglo-Saxon") and Jutes, more recent studies indicate that it was essentially a hybrid of Frisian (the closest relative of English, which is spoken in the Netherlands where it's an official language) and Saxon, created by British Celtic-speaking natives. And it's in that Celtic connection that the weirdness of English really shows. Not in vocabulary (other than archaisms, no Celtic words are heard in English) but in a few quirks of grammar, including "do" and "-ing." English speakers use the meaningless word "do" in questions (Do you know the way to San Jose?) and negations (I don't understand French). All other languages get by fine without the equivalent of "do." (¿Conoces el camino a San José? No entiendo Francés.) All, that is, except Celtic. Welsh, for instance: Did I open...? is Nes I agor...? where nes = do. Other than Celtic and a single obscure Italian dialect (Monnese), none of the world's other 6,000 languages use "do" in this way. Then there's "-ing." Present tense in English is, for instance, "I write, you write, he writes," just like other PIE-derived languages. Except it isn't. "S'up?" you ask me as you walk into the coffee shop. "I write my column for the Journal." I reply. Huh? "I'm writing my column" — present progressive, right? Again, other languages get by just fine with the "regular" present: J'écris in French, (Yo) escribo in Spanish. You can say, "(Estoy) escribiendo," in Spanish but you'd be doing it for effect: "Now I'm writing, but in an hour I'll be partying." So where does our English "–ing" oddball come from? Yep, Celtic. Britons living in present-day England were speaking Celtic for thousands of years before invaders and settlers from continental Europe arrived, starting around 450 AD. The newcomers partially displaced the people (30 percent of white British DNA matches that of modern-day white Germans) and wholly erased their language, except for those little "do" and "-ing" Celtic constructions. Which is why you can legitimately ask of the above, "Does he know what he's talking about?" But not, "Knows he what he talks about?"